LOUISVILLE, Ky.–(BUSINESS WIRE)–Chocolates are great. Flowers are nice. 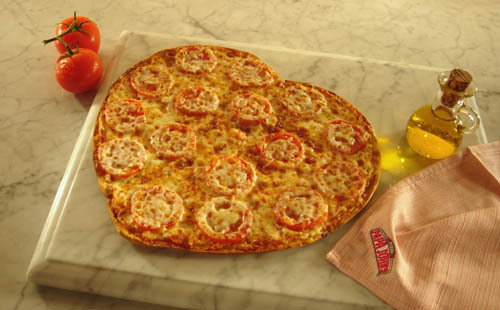 And diamonds say, “I love you.” But to really heat things up this Valentine’s Day, a Papa John’s heart-shaped pizza will certainly do! Available now through Feb. 14, couples and loved ones can skip the crowded, over-priced dine-out spots by ordering this limited-time pizza that everyone will take to heart. Last year, Papa John’s sold more than 60,000 heart-shaped pizzas, proving many consumers forgo the fancy Valentine’s Day dinner to spend quality time at home with significant others, friends and family. To please even the most discerning couples and families alike, customers can mix and match toppings to ensure everyone receives exactly what they were hoping for on Valentine’s Day. Valentine’s Day is traditionally one of the busiest days for restaurants. The average love struck consumer will spend $120 on Valentine’s Day related gifts and events. Headquartered in Louisville, Kentucky, Papa John’s International, Inc. (NASDAQ: PZZA) is the world’s third largest pizza company. For 10 of the past 11 years, consumers have rated Papa John’s No. 1 in customer satisfaction among all national pizza chains in the American Customer Satisfaction Index (ACSI). Papa John’s also was honored by Restaurants & Institutions Magazine (R&I) with the 2009 Gold Award for Consumers’ Choice in Chains in the pizza segment. Papa John’s is the Official Pizza Sponsor of the National Football League and Super Bowl XLV, XLVI and XLVII. For more information about the company or to order pizza online, visit Papa John’s at www.papajohns.com.